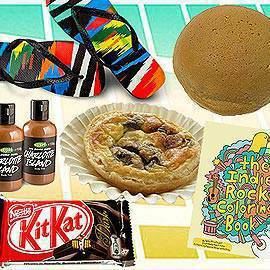 Limited edition Missoni Havaianas, the Indie Rock Coloring Book, Dark Chocolate Kitkat, and more! This week, we stumbled upon some great summer finds: Beat the scorching heat yummy shakes, fake your tan with a just-came-from-the-beach body tint, or protect your skin with a new SPF 130 sunblock (the highest in all of Asia!). Plus, check out the new, uber stylish, limited edition Havaianas we found for your feet, and possibly, the coolest coloring book ever made.